Saint Christopher was a man of great size and strength who devoted himself to Jesus by helping travelers cross a dangerous river. One day a child asked to ride on Christopher's shoulders across the river, but the infant seemed to grow heavier and heavier with every step. When they arrived on the opposite shore, the child identified himself as Christ, telling the holy man that he had just carried the weight of the world. Saint Christopher became one of the most popular patron saints for travelers in the Middle Ages. In the book of hours by the Spitz Master, the miniature of this scene precedes an intercessory prayer to Saint Christopher. The miniature is characterized by an intimate, even playful quality. As the saint gently grasps Jesus' foot, the child tenderly clasps the saint's hair in a gesture that underscores Jesus' humanity. 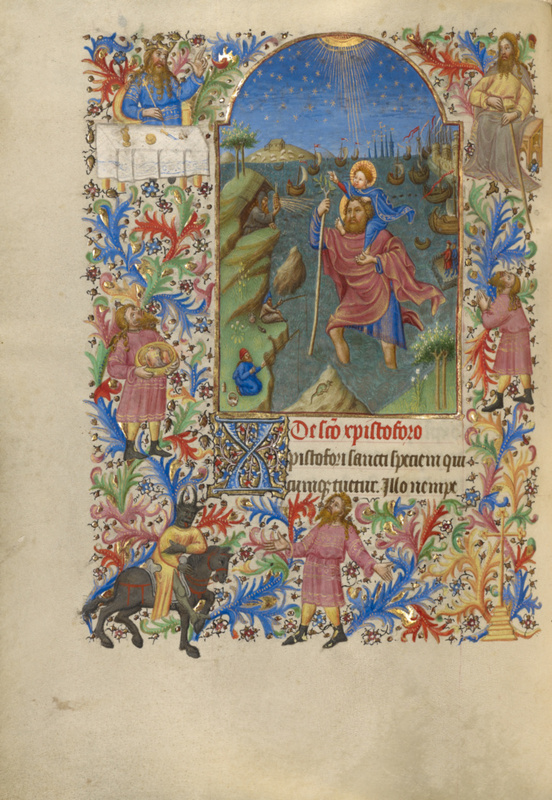 In the miniature's border are scenes from the life of Saint Christopher. With a high horizon line that flattens out the long and distant vista, the handling of the image is typical of the International style. The silvery, turbulent river extends deeply to the far horizon, while the boats' full sails give the miniature a lively character.